I'm about an hour late on my schedule today (I'm never ever early! )......so here we go! 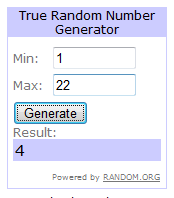 And I figured, what the heck, I'll draw a third winner! Congratulations to the three winners and thanks to everyone that entered! Have a wonderful stitchy weekend everyone! Congrats to the winners, it was a lovely idea for a giveaway. Congratulations Shanda, Lesley and Nia. Darn. 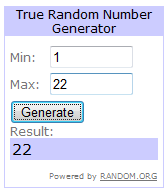 And thanks for having the giveaway! That was fun. Drats! But congrats to all the winners, those lucky ducks! Just signed up as a follower to your lovely blog. Congrats to the giveaway winners. You have some lovely stitching. Congrats! Thanks for doing the giveaway Lesli! Congratulations to the winners. Have fun picking out the new threads. I'm so excited :) I've never won anything before :) Thank you so much!! I'm behind in posting due to the computer being in the shop because of the great bee adventure which will be blogged about sometime this week!! Congrats to the winners. Lovely giveaway. Too bad I missed out as I've been really, really behind on blogs. Just got caught up. I got my floss yesterday and love, love, love it!! Filled in a few gaps in my dmc collection and got several that I needed for ongoing projects. Thank you so much for your generosity!! !